I am infinitely grateful to Nelson Nash for introducing me to the Infinite Banking Concept®. It’s a very powerful concept that brings to the table Nelson’s life-long study of the Austrian School of Economics. 1. His first book, Becoming Your Own Banker®, was copyrighted in 2000. Since then, there have been several editions of the book; however, changes and updates have only been made to the introduction and addendum. Nothing else has been updated, which means the illustrations and numbers in it are woefully out of date. I have asked Nelson about this, and his response is that it’s about a concept, not about specific numbers. But whole life insurance policy dividends were much higher in 2000 than they are today. Dividends historically have followed the path of interest rates, which were much higher then. Charts based on illustrations that are 16 years old (or older) are simply confusing at the very least, and misleading at worst. 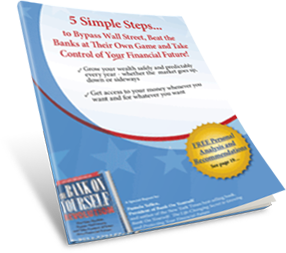 Get instant access to our FREE 18-page Special Report, 5 Simple Steps to Bypass Wall Street, Fire Your Banker, and Take Control of Your Financial Future, plus a FREE chapter from Pamela Yellen's New York Times best-selling book on the concept. 2. Most of the examples in Nelson’s book show examples of becoming your own banker by taking dividend withdrawals, rather than policy loans. Only one example involves policy loans. Nelson’s response was that when you use the words “loans,” it tends to prejudice people. I disagree. To me, it means only that you simply haven’t addressed that concern properly. 3. Nelson Nash discusses how to jump start the growth of a dividend-paying whole life policy by adding a Paid Up Additions Rider. But he has never updated his book on the Infinite Banking strategy to show the power of adding one more rider to the policy, that results in even more cash value and death benefit, over time. It was discovered by one of the Bank On Yourself Authorized Advisors, and Nelson is fully aware of it. Not updating the book to include the additional rider makes it less current and less relevant. Learn more about how a dividend-paying whole life insurance policy can be structured for maximum cash value AND death benefit here. I’ve pointed this out to Nelson numerous times, but his response is always to dismiss the rules and regulations as ridiculous. He may be right, but using that terminology can – and has – gotten insurance agents into some big trouble. That’s why I refer to this concept as “Bank On Yourself®” instead, and am very careful to be compliant with the laws and regulations. 5. For many years, Nelson Nash did not defend his trademarks or guard his terms, The Infinite Banking Concept® or Becoming Your Own Banker®. As a result, there are many imitators and copycats trading on his terms. Some of them are good stewards of Nelson’s concept, but unfortunately, many are not. That has lead to some people who think they are implementing Nelson Nash’s ideas, when they are not. When I first met Nelson Nash, I promoted his book and concept tirelessly. Nelson even told me that I sold more of his books in the first six months than he had sold in the previous three years. For some reason, Nelson has never listed my New York Times best-selling books on this topic on his extensive recommended reading list. I don’t know why, and that’s okay. I will continue to do as Nelson does and push back the frontiers of ignorance. However, I am doing it in a way that improves on the concept, due to my discussion of the second rider. And I’m doing it in a way that will not put anyone at risk for using terminology that violates state laws. By educating people about a better way to save for the future and become their own “bankers,” I like to think I’m carrying on Nelson’s legacy. At the same time, I’m helping people understand ways to maximize the power of the Infinite Banking Concept®. To learn more about this concept, I encourage you to download my FREE Report, plus a free chapter from my New York Times best-seller, The Bank On Yourself Revolution: Fire Your Banker, Bypass Wall Street, and Take Control of Your Own Financial Future. You’ll learn all the basics of this concept, and where to find an Advisor trained in proper implementation of this concept. So why not get your FREE Report and Chapter here now, while it’s fresh in your mind? Thank you for those additional points. Very informative. Will be having a deeper look into IBC. I’ve also enjoyed his book but found it confusing. He makes it look like he can take a loan but as a withdrawal that doesn’t lower his cash value. He then puts the mo way in as a premium payment in his words when really it is a repayment of a loan. So is he using loans and really paying back the loan plus a little more or is he taking a withdrawal and then paying back the withdrawal amount plus a little more as premium? I believe he is borrowing from the insurance company and his cash value is the collateral. I think he is then paying himself back over 4 years plus a little extra because of a higher interest rate. Yes, he is actually taking loans and repaying “extra” into the paid-up additions rider. We explain how dividend-paying whole life insurance policy loans work much more clearly here.